Hi all. I wanted to share some screenshots of a project I've been working on. 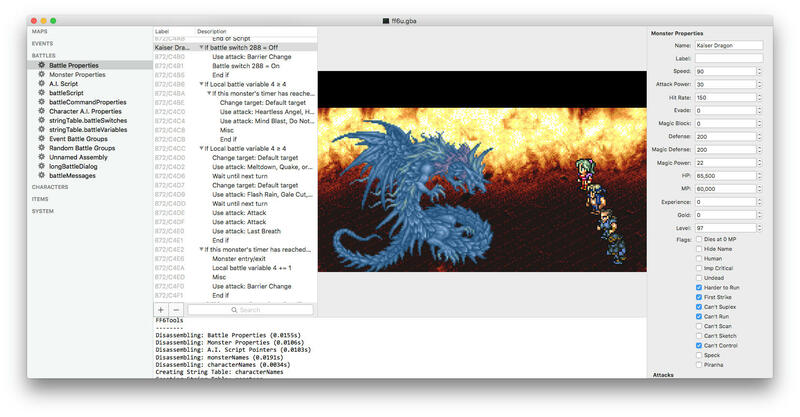 This is FF6Tools - a ROM editor for OS X. 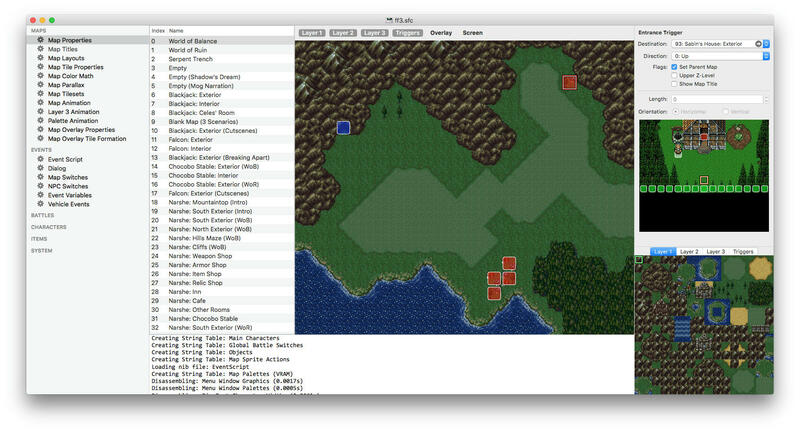 It has a map/event editor and a battle/monster editor, as well as tools to edit a lot of other game data. 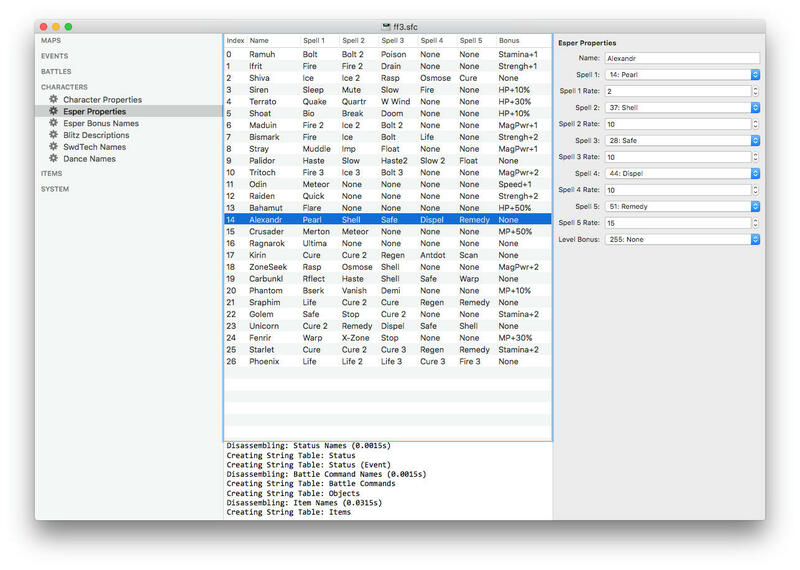 I'm especially proud of the event script editor. You can insert and delete commands and then it recalculates all of the pointers when you save so that everything still matches up. I find it a lot less tedious than making events in hex. 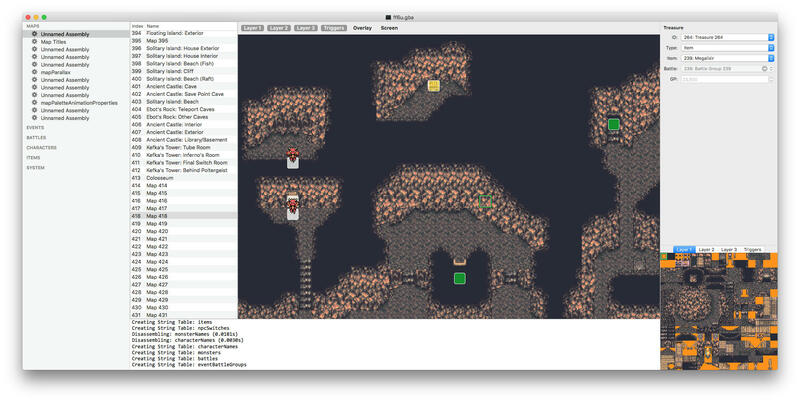 I'm not quite ready to release it yet, but I've made a lot of good progress recently and I'd like to find a couple people willing to test it out to help me track down bugs. Shoot me a PM if you're interested. While that is utterly amazing, I'm irked there's an Event Editor I can't use because I'm on Windows. I go cry somewhere else. Good job, it's a really impressive feat. Step forward, spriters! We are also responsible to make hacks look new and fresh, we are no less important than code or ASM hackers! CHARGE!! Is that really happening? there's the potential risk at this rate that it would be more convenient to transfer our work on GBA? 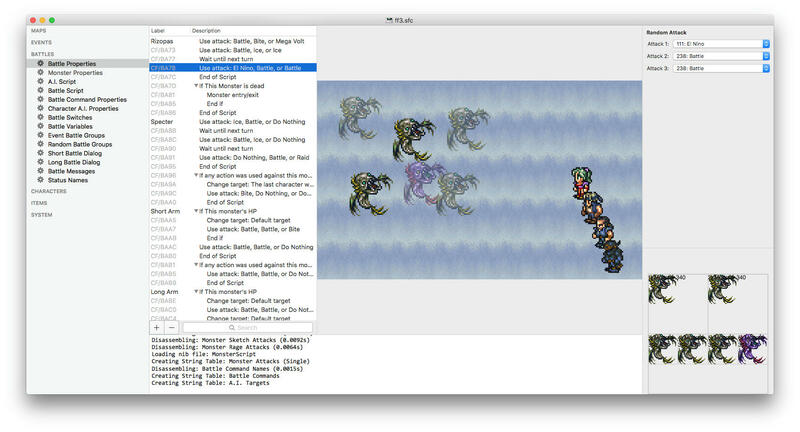 btw, what's not yet covered from your GBA tools that SNES version has instead? 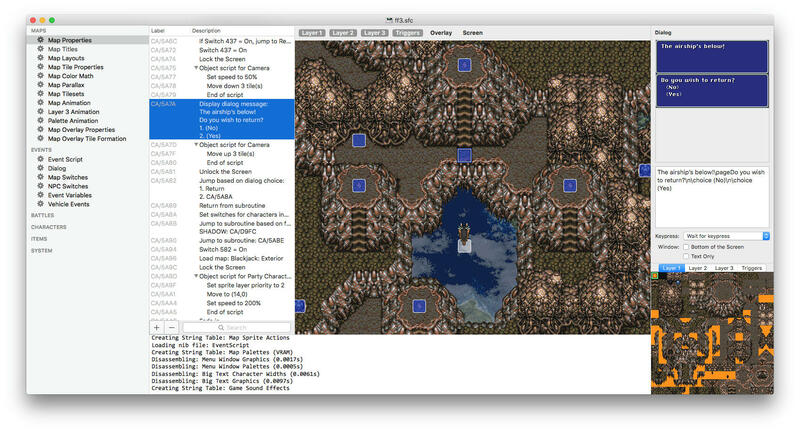 About Snes... aside your event editor is there any other tool you made that deals with stuff that currently available tools still don't do? Amazing work! i sent you a pm regarding some stuff. Very cool. 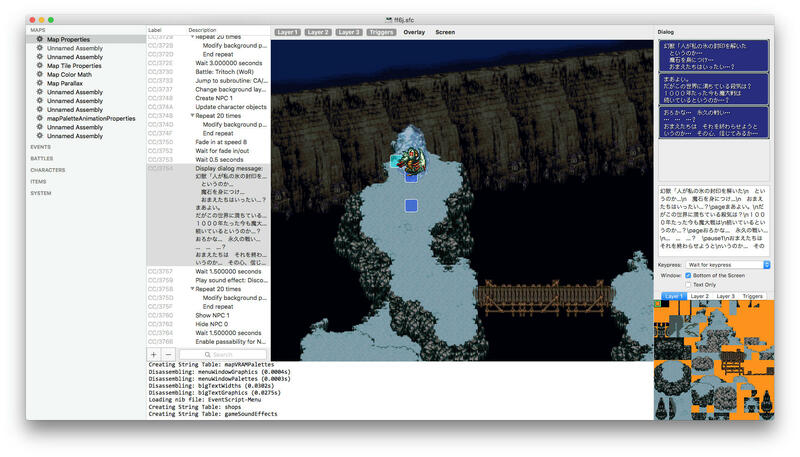 Hopefully this will get those mac folks interested in FF6 modding. Even I might yet find use for that old macbook in my closet. 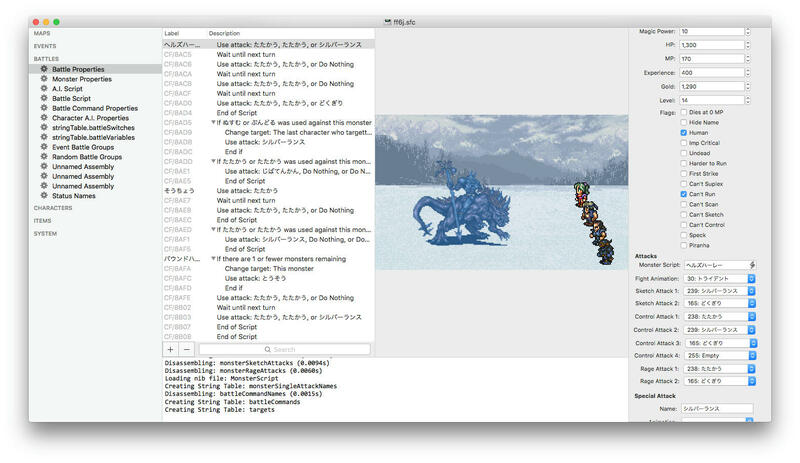 If this works on Snow Leopard, I'd be happy to test it. (08-31-2016, 04:54 PM)Tenkarider Wrote: Is that really happening? there's the potential risk at this rate that it would be more convenient to transfer our work on GBA? The GBA support is very much a WIP. I've been getting things to work on the SNES versions first and then transferring them over as I go. Eventually it should be possible to get everything working for any version of the ROM (even the PSX version and fan-made hacks). It just takes time to find where all the data is located. This looks beautiful, when can we expect to be able to test it?